Will I Write Fantasy Again? I’ve been asked before now whether I will write fantasy again and therefore chose to answer that question in video form. I hope that it is informative of who I am and have been as a writer and what you can expect in the future. On the 20th June 2015 I released my first book Our Doris at Macclesfield Library. I arrived with my mother half an hour early to set up the room, meeting my good friend Lindsey on the way. (She crossed the country for me and proved just how good a friend she is.) Incredibly nervous, I envisaged no one arriving, and being left to share cakes and books with my family. I had spent the best part of Friday baking in preparation. I made a Victoria sponge, a lemon sponge, a chocolate gateau and a carrot cake, mentioned only because I want bragging rights. They were rather thin sponges and I question the use of 1970’s cook books, but folk offered compliments on them. Once we reached the library we embarked upon a quest to get the Meeting Room ready in the half hour I had before my guests arrived. There was something of a mad dash in my mind because the tables weren’t as I had envisaged and there weren’t enough chairs – I’d asked for fifty and there were only about ten but we found a caretaker and he was kind and fantastic and he took the book I was donating to the library and honestly I wish I’d found out his name because he was kind enough to help an incredibly nervous writer and not complain. My earlier torment that folk wouldn’t arrive was non-founded when a lot of people arrived. Well thirty-seven, but since I was only allowed fifty people in the room I was happy. Rosie and Liz, my uni friends came to see me, as did more friends and family and folk from work and Weight Watchers – I count them amongst friends as well but I wanted more space to brag. I introduced Our Doris and thanked everyone for helping me. I know that writing is a solitary pursuit but the actual act of putting a book together takes a whole host of planning and preparation and without my friends I would be nowhere. The people that I wanted to thank were there – I’ve mentioned them on the blog before, and they know that I thank them. Some people I thanked because I saw them around the room and I wanted to thank everyone individually but a lot of the time it’s just being grateful for support. Once my rambling speech was over I chose to read the first monologue from the book ‘Slugs’. I developed a nervous dry mouth and was exceptionally glad for my glass of water. And fortunately enough I used full stops so had chance to breathe. The reading seemed to go well. Alas, I didn’t have enough time to mingle as I sold out of books and had to sign them, but this is not a complaint. Folk managed to speak to me and being amongst friends no one wants you to fail. Questions were asked and answered – there’s a question that’s plaguing me at the moment, but I’m planning on answering it in a later blog post so that won’t be answered here. Honestly, the launch went as well I had hoped and then some. There was this wealth and depth of support I hadn’t expected. I’ve always had this anxiety that people expect me to fail, or want me to fail in some way and I sold out of books and was able to celebrate a book that I have released myself. Our Doris is self-published and that meant having a lot of faith in my own work and my own ability as a writer. I’m twenty-two, I have a lot more to learn about the publishing world and writing in general and it’s a world I want to be part of. Our Doris is a book I am incredibly proud of and I am prepared for bad reviews and for it not to sell but it doesn’t stop the aching hope I have in my chest that we will be successful. I want to show to the world that I can write and I can write well. Whether I can or not is up to you, now. Our Doris is released in less than two weeks and I disappeared two months ago ne’er to write a blog post to explain what is going on. I’ve kept the events page updated so you can have some fun looking over that. I have been busy organising readings and interviews to discuss the book – the giveaway on Goodreads ended a few weeks back and the five winners have since received their copies. Today, I thought I would talk about what inspired Our Doris. I’m not sure whether it is something I’ve talked about before and if I have no doubt the answer has changed because lord knows there are that many things that inspire me – as has been dually noted many times before and is something of a bone of contention with my good friend Imelda. I know that in the past I’ve talked about how I wrote the first line in a writing burst because I had nothing to write about and used that to get me through writing bursts from that point onwards. However, after I had been writing the bursts for a while folk would ask me if I would compile them into a book because surely I had enough material . The only problem was that I did not want to compile a lengthy amount of sections that at most only amounted to 200 words. I needed to find plots that could connect with one another and create a book that I felt represented Doris and I would like to represent me. For that I needed a plot that could last for an entire book. I knew that I was going to start the book with the first monologue, ‘Slugs’, because that was a natural start but then I needed a reason for Doris to despise slugs enough that she would set about the garden herself. Doris is very much a character who doesn’t like getting her hands dirty – not in that respect anyway. Thankfully I have an amazing friend in the form of Margaret Holbrook who mentioned the garden safari in Poynton and with an added element of the WI I had a plot. Of course, there were a few months where I decided releasing a book on my own was too scary and stopped writing in favour of finishing the children’s book. Now, however, the book is coming out next week and people are already giving it nice reviews. Originally, I intended to write thirteen monologues, similar to a television series with one for every month of the year. It turned out that a few of them were useless and went over old ground and thus they were cut in favour of giving the book ten monologues of excellent quality than a book with a few wishy-washy stories. Our Doris breaks all the rules I learned from text books and university. It’s written in what I call a conversational style that was influenced in part by listening to my family tell stories over the years and partly because of Alan Bennett’s Talking Heads, of which I will always be a fan. One question I received today was, ‘How can you as a twenty-two year old write about a man who is seventy-four and his wife who is seventy-two?’ And at first I didn’t have an answer. In my work I am surrounded by people of the older persuasion and they are all fantastic. I think there’s this stereotype that once you hit a certain age that’s it, your life is spent at home watching ITV3 and eating custard creams, and yes, there is a certain amount of that in the book – simply because I do stay home and watch ITV3 and eat biscuits – but in reality your life doesn’t stop just because you’re retired. In fact, most retired people I meet find that their lives get busier once they no longer have work to go to. I also look at Roy Clarke who began writing Last of the Summer Wine when he was thirty-three. He wrote about characters a fair bit older than himself getting up to things that would be seen as suited to younger people – and it worked – I say it worked because it is one of my favourite television shows but we’re heading into different territory. The writing is inspired by my favourite writers as well, the writers I’ve mentioned above and Victoria Wood. There’s a great wealth of British comedy that has helped shape and inspire Our Doris and yet I feel like I brought my own thoughts and experiences to the story. Yes, I have stolen some stories from people I know, but if they notice let’s hope they don’t mention it. I’m hoping that this blog post covers most of what I wanted to talk about today, I’m not going to promise a post in the near future because we know how that’ll go. Also I’ve not done much reading so I doubt there will be a wrap up this month. I need to find some more fantastic fiction. 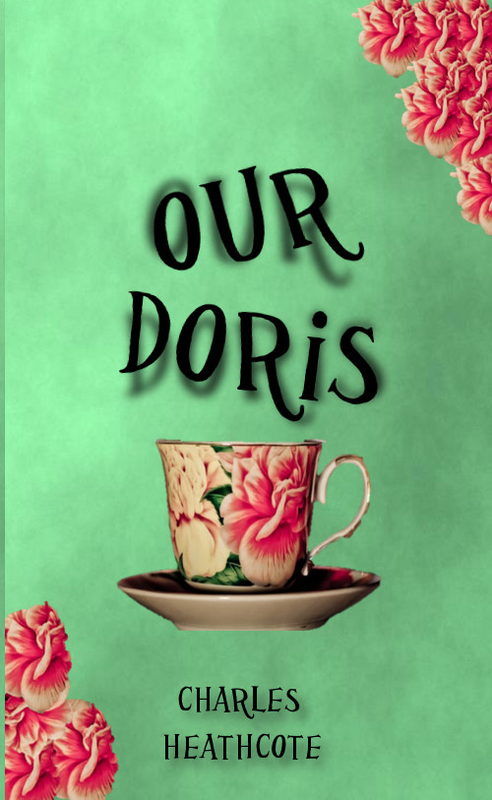 It’s been too long since I announced that Our Doris was coming out this year. So much so that it now has a Goodreads page, and I’ve booked a few events – check out the Events page to find all the glorious things – and I’ve read my proof copy. Although it’s not completely ready and my rather awesome friend Imelda is going through the book once more for me. I made a list of posts to write for you and didn’t write them. I’ve spent a lot of time reading and planning another book. I’m just going to say that Our Doris will launch on the 20th June 2015. The Macclesfield Creative Writing Group has met at Macclesfield Library since it began in 2011. Since Our Doris was first conceived in a workshop there it seemed only fitting that I host the book launch there as well. The event runs from 10:30am – 12:30pm. I will read passages from the book, and as only befits Doris there will be tea and cakes and a Q&A session. Tickets cost £2.00 – and each ticket holder will be placed in a raffle to win a copy of the book. You can pre-order the book on Waterstones and Foyles, and I need to figure out how to create a pre-order button on this site. I hope there won’t be too much of a delay between posts this time. If you start to question where I am follow me on Twitter where you can lambast me to remember to say hello to folk every now and then.